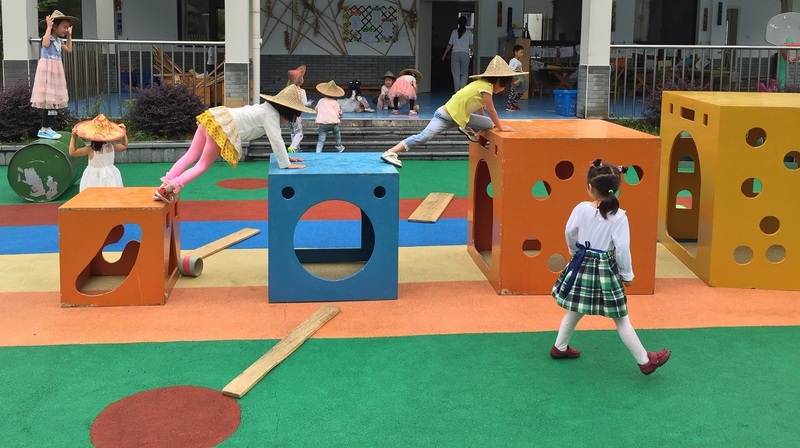 Play Schools are known by Pre-primary School, Pre-School, Nursery School or Kindergarten. All these are designed to offer Early Childhood Education (ECE) to children for kids between the age group of 2½ to 5 years. A Play school is a place where around 10-20 children spend a few hours regularly under the supervision of trained teachers and professionals. The curriculum does not aim at developing academic skills; it only focuses on social development and character building of a child. At this phase a child is very observant, and hence they can learn things just by imitating and following instructions. There are no rules or goals as such and there is no pressure imposed upon children, the kids are handled patiently and allowed to learn at their own pace. Children are not born with skills, they have to develop them. This is where the play school steps in to not only help the children but also provide support to their parents. The parents have a chance to observe their own child and the other toddlers and get a reference for judging their own child’s behavior. Play schools offer an external support system to the parents, where they also get an opportunity to interact with other parents and keep in touch with different approaches to parenting. Parents can easily access the trained supervisors for advice if they are facing any problems with their child at home. Apart from widening parenting horizons, play schools offer a lot for an all round development of a child. Pre-Schools provide different facilities under one roof like Learning Toys, Puzzles and technology based Toys, different types of learning activities & many more facilities. All these activities are done by kids under proper guidance so that it becomes a learning experience. When a child plays with a doll and dresses it up and feeds it, the teachers aim to transfer their behaviors into their own lives. This way a child will eventually learn to feed and bathe themselves. Nursery Schools also teach children to recognize their own possessions. A child learns to take care of their own belongings and not misplace them time and again. A child’s language skills also develop faster as they interact with many children of their own age and learn to connect better. Play Schools prepare children for their smooth entry into formal school as they help to minimize separation anxiety. They prepare children to face the world, as they are more self-confident and independent also they have improved interpersonal skills and better capabilities. How to teach Kids Money Management at Early Age? MySchoolReviews.com is a free school listing and reviewing website. We aim to help parents to find the best school for their children. Please leave your reviews and contribute to make this website useful for other parents. Thanks for visiting!